MMPA President Ken Nobis speaks at a candidate forum hosted by ALM at Zeeland Farm Services, Inc. in Zeeland, MI on May 8, 2018. Photo credit: ALM. The information age has ushered the world into a place where instant knowledge is delivered with a simple search. But getting the correct information to the influencers at the right levels to generate positive results for Michigan agriculture still requires a special focus. The Agricultural Leaders of Michigan (ALM) coalition was formed to take on that challenge. The organization, founded seven years ago, is a coalition of agricultural, commodity and agri-business leaders committed to promoting Michigan agriculture, participating in the ongoing dialogue about issues affecting the state, and harnessing agriculture’s power and potential to further grow Michigan’s economy. Today ALM focuses on many issues, from trade, to the upcoming Farm Bill and the future of the rural economy. As an integral part of Michigan’s agricultural sector, the Michigan Milk Producers Association has been a member from the beginning. Other members of the coalition include GreenStone Farm Credit Services; the Michigan Agri-Business Association; Michigan Soybean Promotion Committee and Michigan Soybean Association; and the Michigan Pork Producers Association. Because legislators represent a diverse constituency, ALM hosts many different events throughout the year, including “Lunch and Learn” events to provide a chance for lawmakers, their staff and executive branch officials from the Michigan Department of Agriculture and Rural Development to zero in on key issues in the industry. MMPA hosted a Lunch and Learn on May 21 to provide education about MMPA and Michigan’s dairy industry. “The Agricultural Leaders of Michigan are an excellent resource for elected officials and their staff members in Lansing because ALM’s many activities keep them up to date and informed on key issues affecting the agriculture industry,” said Travis Howell, who has served in multiple staff roles for Lansing policymakers. ALM has not let any grass grow under their feet as they have hosted several informational activities in the first few months of 2018. Trade has been in the headlines, with a renewed focus on the future of North American Free Trade Agreement (NAFTA) and partnership with China. ALM has frequently discussed the importance of trade with members of the Michigan media, emphasizing the “Mend it, don’t end it” message on NAFTA and the importance of expanding markets in Asia through new trade partnerships. The coalition has issued many press releases and hosted a March media conference that resulted in statewide press coverage. In March, MMPA leaders and board members had an opportunity to meet for breakfast with several members of Michigan’s Congressional delegation, as part of a regular breakfast hosted by ALM in Washington, DC. Following coffee with the members of Congress, ALM members also received policy update briefings from staff of the U.S. Senate Agriculture Committee. This spring, ALM conducted briefings across Michigan to help candidates for office learn more about the industry and the work of MMPA. 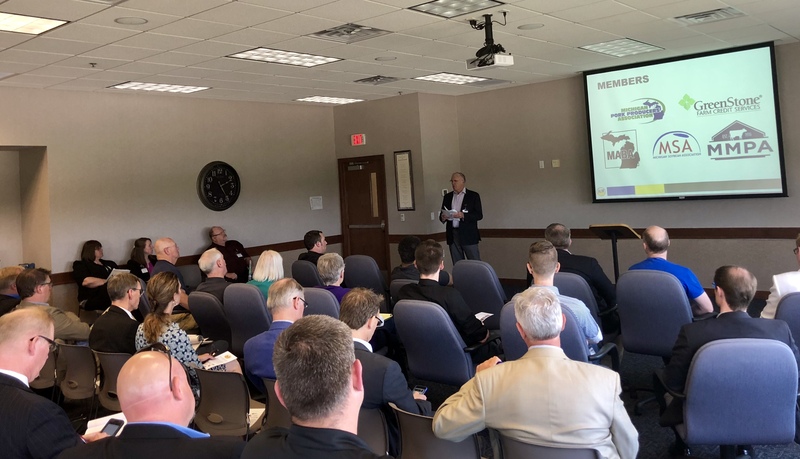 President Ken Nobis provided an overview of the cooperative at the briefings and answered questions from candidates – an important way to build relationships with those who will shape policy in Michigan in the years to come. A wide range of topics are highlighted at ALM events – from updates on crop progress to challenges from disease and weather events to nutrition guidelines and opportunities to increase exports from Michigan. MMPA provided an update for these staff members in December 2017 and will meet again in 2018. ALM continues to press on to promote Michigan agriculture and share important information on the industry with policymakers, the media and the public. You can follow ALM on Facebook by visiting www.facebook.com/AgLeadersMI and on Twitter by visiting www.twitter.com/AgLeader_MI. You can learn more about the Agricultural Leaders of Michigan by visiting www.agleadersmi.com. This article originally appeared in the June 2018 issue of the Michigan Milk Messenger.